A snapshot of one of Rosy's Chelsea Flower Show displays. Rosy Hardy was awarded her 22st RHS Chelsea Flower Show Gold Medal in 2017. The nursery in high summer. 1988 was the year that I started growing plants, after having been to a car boot sale in Ascot whilst clearing out the garage. I saw plants available for sale and came home and dug up the garden. From such small beginnings a very successful nursery was born. We have been incredibly lucky at Hardy's Cottage Garden Plants, moving from a back garden to an amazing walled garden at Laverstoke Park, where we flourished, and finally to our purpose built site here in Freefolk which we are happy to call home. During this time I always insisted we grow our plants in a more traditional manner, making sure they are tough and resilient. The answer is twofold. Firstly my sister-in-law Anne Liverman, a renowned gardener from Derbyshire, was an avid perennial grower and collector, having always looked out for good plants that were both traditional and interesting. With original material for our stock coming from her as well as from my own garden, it was soon obvious our customers wanted cottage garden perennials, so we specialized. The plants are grown in containers outside all year round. They are not overfed or over-watered, creating good strong healthy plants ready to go into your gardens. We have over the last few years gradually become peat free, using Melcourt Sylvagrow, which has been a wonderful success. 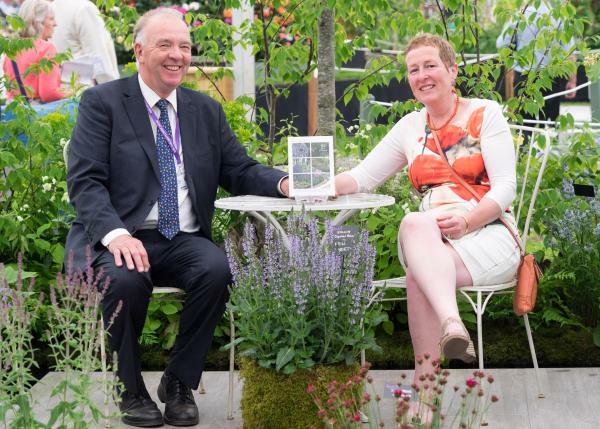 Pictured - Rosy & Rob sitting in their 22nd RHS Chelsea Flower Show gold medal winning display .